The Icicle River Valley is a spectacular outdoor playground that supports a wide variety of native species and wildlife. A perfect example of the Icicle Valley’s balance of recreation and biodiversity is Sam Hill—a 40-acre property renowned for spectacular climbing, wildflowers, and native species. Sam Hill boasts more than 12 well known crags, but access was threatened when development became a real possibility. Local climbers and Land Trust members Mark Shipman and Freeman Keller led the drive to protect the property from impending development. 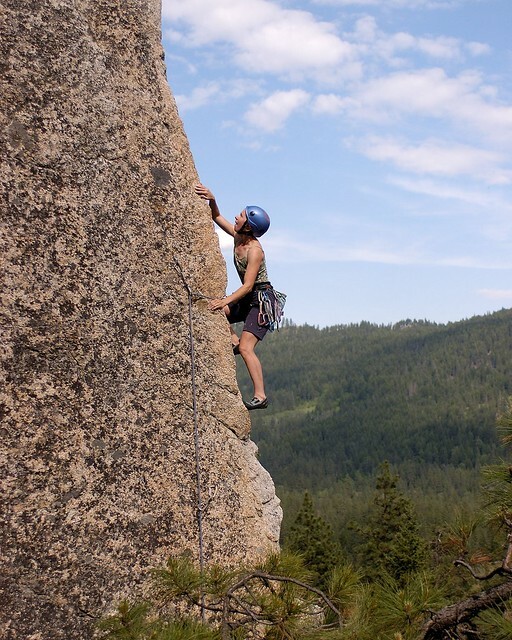 Thanks to a coalition between the Chelan-Douglas Land Trust, Trust for Public Land, and the Washington Climbers Coalition, Sam Hill was purchased and permanently protected in 2005. And thanks to Land Trust stewardship, the balance between recreation and healthy habitat will always be maintained. Located at the beginning of Icicle Canyon, Sam Hill is a great place to explore. The trails in the area were established by climbers, are unmaintained, and often are quite steep. We recommend wandering the property in the spring to catch some amazing wildflowers. For rock climbing in the area, visit Mountain Project’s webpage on Sam Hill. Directions: Driving west on Hwy 2 from downtown Leavenworth, take a left on Icicle Road. In 3.5 miles, there will be a large pull-out on the left side of the road where you can park. The Sam Hill property is on the north side of the road and the main trail begins directly across from the pull-out. Once you start up the trail, you will notice a few Land Trust signs that will let you know you are in the right place. For a Google map of the parking area, click here.